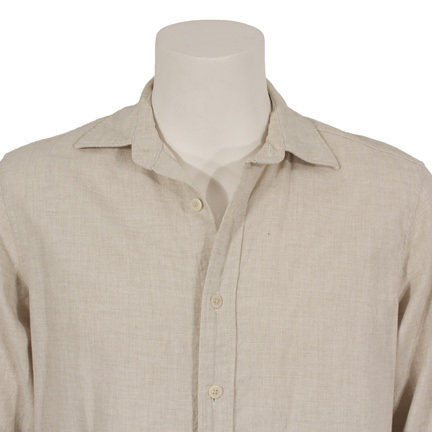 This complete costume change was worn by the character Jack Bauer played by actor Kiefer Sutherland in the eighth season of the award winning television series “24”, which ran from 2001 to 2010. The outfit consists of a cream long sleeve collared button down shirt and a pair of Levi’s “Capital E” Hesher boot cut denim jeans. 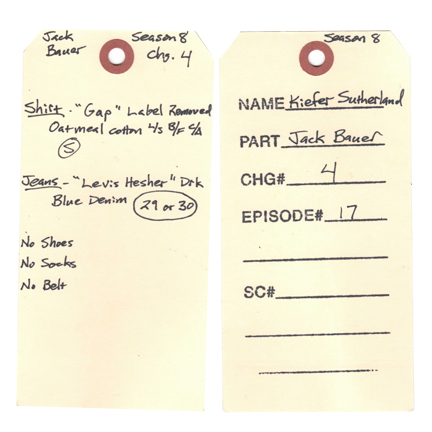 Costume HOLD tag attached with “Kiefer Sutherland, Jack Bauer, Chg 4, Season 8, Episode #17” and on the verso, “ Jack Bauer, Season 8, Chg 4, shirt Gap, label removed L/S B/F, C/A S – Jeans Levis Hesher Drk Blue Denim Size 29 or 30, no Shoes, Socks, Belt”. 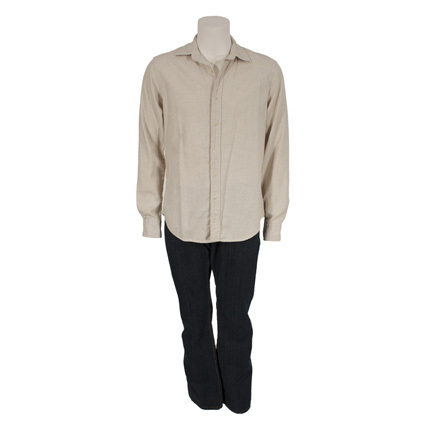 Mr. Sutherland appeared wearing this costume in Episode 17 (Day 8: 8:00am – 9:00am) during the scene in his apartment when he changes into it after making love to Renee Walker (Annie Wersching). As the barefooted Jack prepares some food in the kitchen, Renee is suddenly shot by a sniper. Bauer dives for cover and crawls to her side as more shots are fired. A bloody distressed version of the shirt was worn in the subsequent sequence after Jack manages to carry her out of the apartment but fails to get her to the hospital in time to save her life. 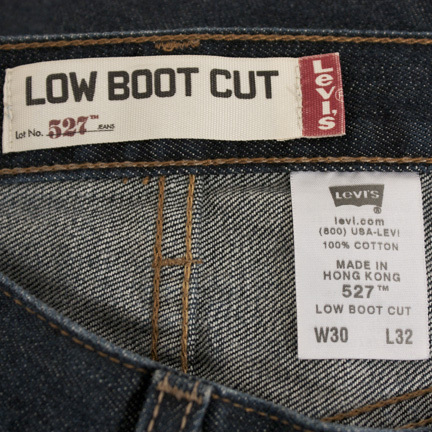 At the beginning of the following episode he is given a new shirt and a pair of boots by one of the nurses at the hospital. 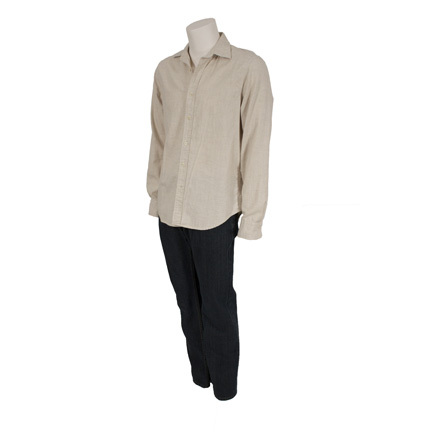 The shooting of Renee Walker was a pivotal moment in Season 8, and this costume from the scene is a rare signature piece from the series. 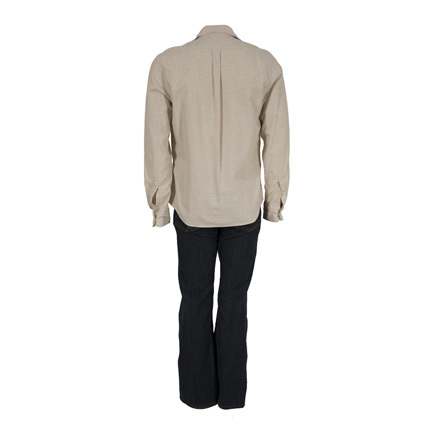 The garments are both in very good screen worn condition and are accompanied by a letter of authenticity from the costume supervisor who worked on the series.